You May Never Have Thought About Food As Medicine, But It Is...Here's Why. Beet Nutrition:Traditional Chinese Medicine Healing Properties! Beet Nutrition. In Traditional Chinese Medicine Beet is a food with considerable and formidible healing powers. Thermically (meaning it has a heating or cooling or neutral effect on the body's temperature): It is neutral. It does not warm or cool the body. 2. Calms the mind and spirit. 3. Improves circulation of the blood. Nourishes the blood. 4. Benefits the liver. Treats liver Qi Stagnation and treats liver disease like cirrhosis. 5. Moistens the intestines. Promotes Bowel Movement. Relieves Constipation due to Large Intestine dryness. Beets are very alkalizing to the whole body...which is a very beneficial property in light of the Standard American Diet's over emphasis on Acidifying foods. This is a food that greatly helps change your body from being too acid to a more healthy alkaline state. Beets are loaded with vitamins A, B1, B2, B6 and C.
The greens have a higher content of iron compared to spinach. They are also an excellent source of calcium, magnesium, copper, phosphorus, sodium and iron. Beets are also a terrific source of choline, folic acid, iodine, manganese, organic sodium, potassium, fiber and carbohydrates in the form of natural easily digestible sugars. Vomiting: Stops diarrhea in many cases...A squeeze of lime with beet juice increases the effectiveness in treating vomiting of many causes. Diarrhea: Stops diarrhea in many cases...A squeeze of lime with beet juice increases the effectiveness in treating diarrhea. Beet juice is very potent, therefore it is best to start with smaller amounts in juice recipes to see how your body handles it and how you like the taste. To start begin with the juice of half a medium-sized beet once a week, slowly increasing to one whole beet a week. Beet juice is so potent that it may cause some dizziness once its cleansing effects kick in and toxins are being eliminated. This is the main reason for taking it slow and building up gradually in the quantity of juice you drink. This dizziness is uncomfortable and may be disturbing when and if it happens, but there is nothing to be alarmed about. During this time, drink plenty of pure water to help flush out the toxins. Choose beet roots that are firm and unwrinkled. 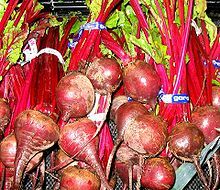 Beets can keep for up to three to four days in the refrigerator if you don't cut off the leafy green part. If you detach the greens, beet roots will keep for a couple of weeks. Beets with round bottoms are sweeter than flat-bottomed ones. The fresher your beets are the more flavorful they will be. Avoid over-cooking beet roots as heat destroys all the essential nutrients and enzymes. Please click here to leave Beet Nutrition and return to Healing...Healthy Foods Page.